Present were a happy group consisting of: Robert Garner (with bagles),Bob Erickson, Grant Saviers (able to walk better), Allen Palmer, Don Cull, Ron Williams, Frank King, Robert Feretich, Don Luke and Ed Thelen. How about that? Bob Erickson was finally cornered by the oral/TV history folks for 2 hours - telling wild tales of long ago and far away - like servicing code breaking IBM tab equipment in Hawaii in WWII - Williams Tube memories on the IBM 701 at Los Alamos, and similar thrillers - well OK I wasn't at the interview - but they shoulda if they didn't!! Bob Erickson identified that some of the 026 keypunch confusion last week was that the printer code plate does not match the documentation. We now have an 8x enlargement of the actual 1x1.5 inch plate to help guide alignment of the plate to print the proper characters. Grant Saviers, Allen Palmer, Don Cull and Don Luke continued reassembling and testing the 729 electromechanicals. 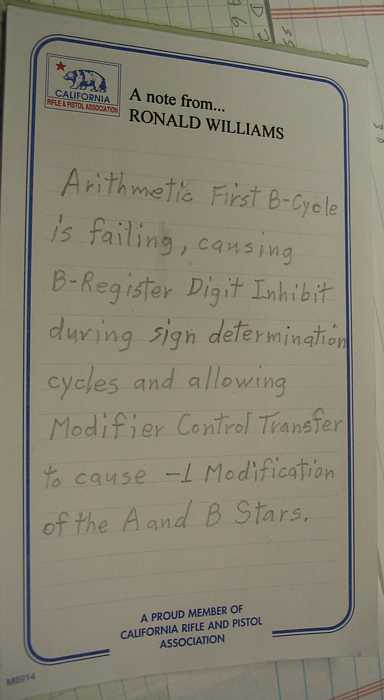 Ron Williams and Robert Feretich struggled with the 1403 print controller - and found another bad board in some counting circuit. The 1401 forgot how to add. :-(( Ron Williams and Robert F were too busy to tackle that too. 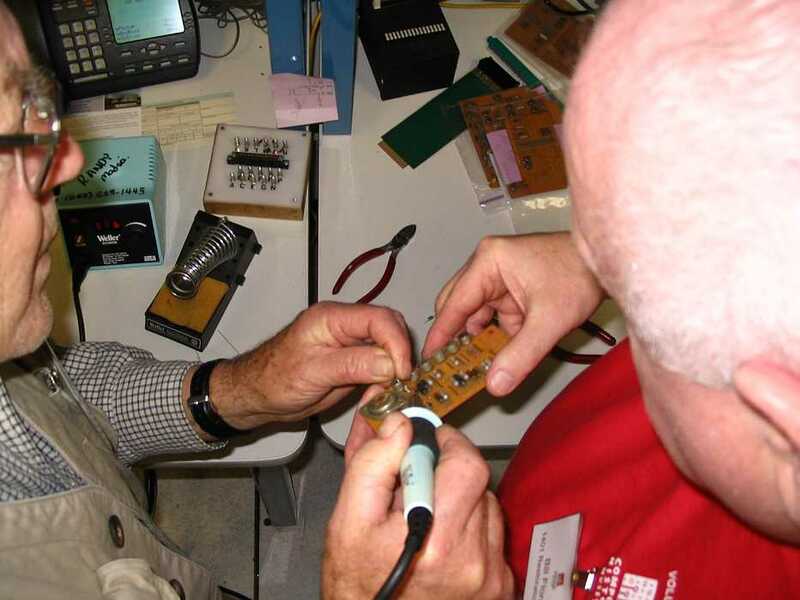 After hours, Robert Feretich showed Ed Thelen the fancy Tektronix 2230 'scope and watched strange pulses coming out of the differential amplifier connected to the 1403 chain timing pickup. The chain sync is generated by two half length pulses - but there was other trash happening about 33 pulses from the sync pair. Probably best to wait for a 1403 expert (Saturday?) 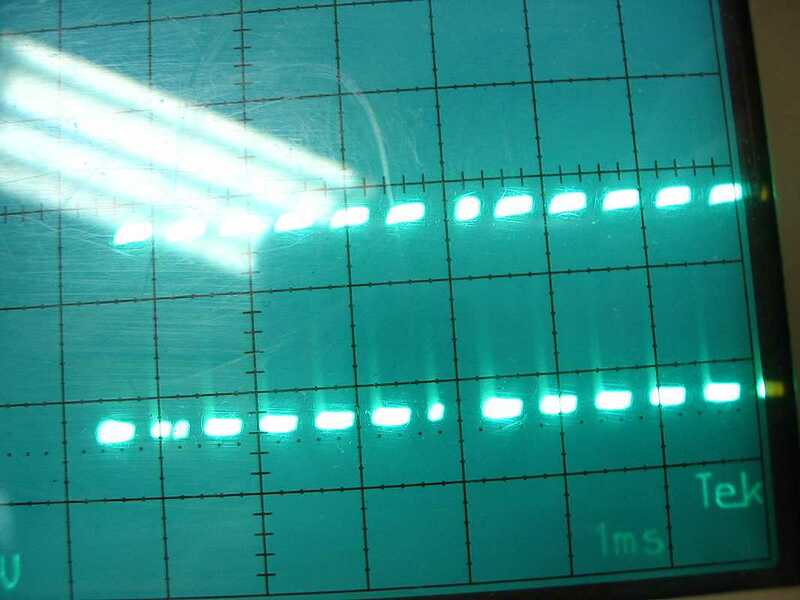 The trash caused pulses like this in the counting circuits - and the printer sync checks? The 1401 seems to have "morning sickness" - things are even worse until it warms up. Chuck Kantmann reported that a week ago - and still that way now. The project (and CHM) received a donation of a 1401 + 12 volt power supply from Richard Whylewill, 48 Horan Road, Vestal, NY ????? - Those power supplies are heavy honkers! The museum (or maybe the 1401 fund?) is reimbursing Richard about $54 for "cheapest way" shipping. 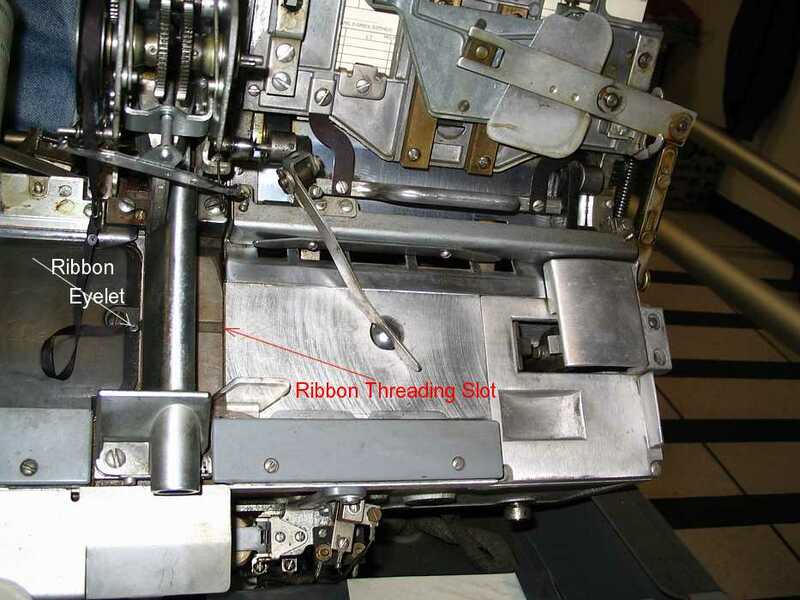 Bob Erickson is preparing to thread the 026 ribbon through the threading slot. The game is to get the eyelet (white arrow) through the slot (red arrow) - no big deal, but ya gotta do it. I asked Ron Williams what he fixed (by card replacement - bad transistor) to make the adder work again. This is what he wrote. Do you have any clue about the meaning of this - I understand each individual word - but he might as well be talking IRS tax code. Life is real "interesting" for Allen Palmer and Grant Saviers. 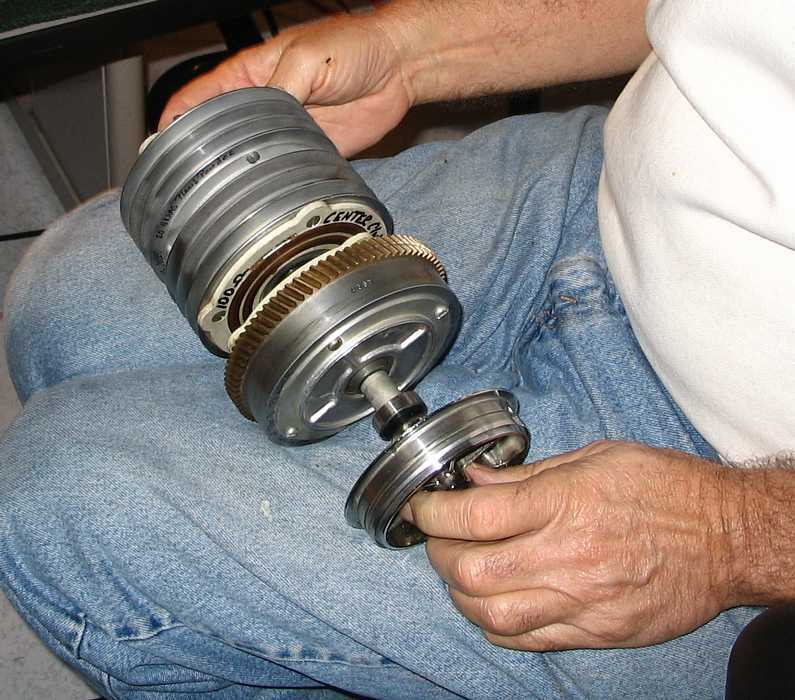 Not only do they have to re-manufacture the clutches for the tape reel movement - they have to re-invent the techniques to get them assembled and adjusted correctly. When re-assembled the first time - with lots of hope - a grinding noise soon started. Something had shifted along the central shaft !! "My analysis is that the way the clutches assemble on the shaft is VERY sensitive to getting each one tight in the way they stack up. The tolerances are cumulative, so any error adds so the driven plate can interfere with the rear cover. We may need to take the bearing shims out. We know that both shaft assemblies were put together wrong in the past from the wear patterns. "Allen, it would be better to have both complete assemblies to measure against each other to see where each clutch is along the shaft. Getting a "master" set of clutch positions that we know works will allow future rebuilds to get done once. "Let me know when you can come to my shop. And here is the 729 with out its clutches - again -. 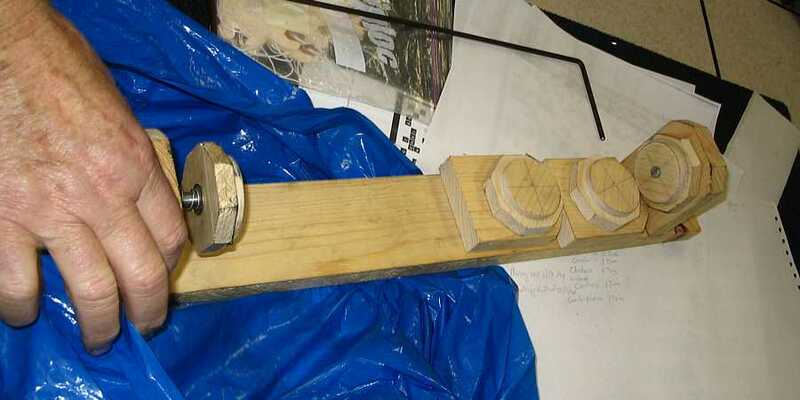 The wooden bar across the top is to help support the clutches and shaft during removal and insertion. Ron Williams reports that he, himself, Grant Saviers, Allen Palmer, Bob Erickson, Robert Garner, and Ron Feretich were present and accounted for. b) the other "U" is 0 to -12 volts. from Bob Feretich - "The 1403 interface seems to be mostly working! We can now print characters in 130 of the 132 print columns of the printer. 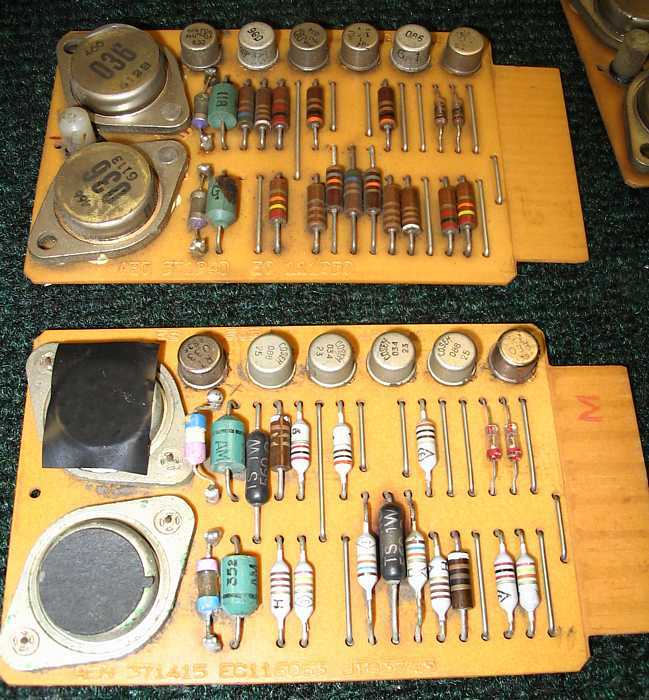 We have two bad hammer driver cards (blown 3 Amp fused) and no spares. I swapped cards to move the bad print positions to positions 131 and 132. We are able to loop print instructions and print at full speed. (Makes a big pile of paper during scoping loops.) The printer mechanics need some adjusting to reduce ink smudging and a couple of hammers are a bit off alignment. There is some kind of character/position sensitivity though. Earlier this afternoon we could not print the characters 4-7 and D-E. But the problem went away. Most likely, I did not have the conditions right to recreate the problem. 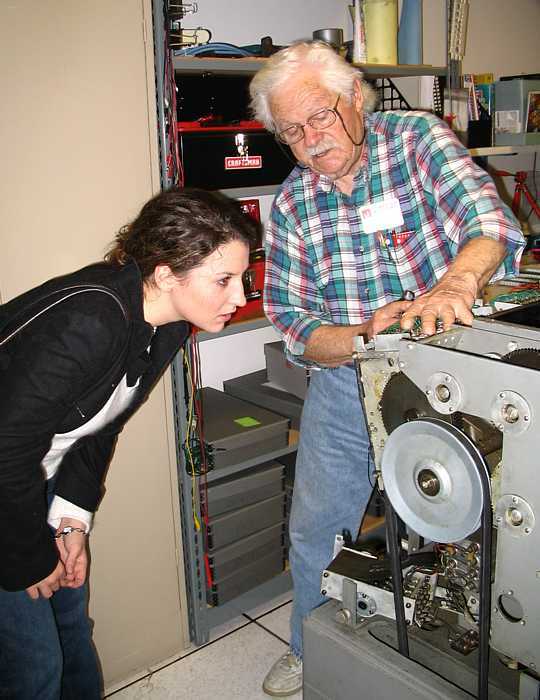 and from Allen's e-mails - "The single 729 model V tape drive is back in operation! Allen and Grant had worked all day Tuesday at Grant's shop to dissamble, make some changes (remove shims, thinner felt washer) and precisely reassemble the two clutch assemblies. On Weds, Allen reinstalled them and they ran perfectly this time with no sounds or problems--smooth as silk, no rattling/scraping noises while in 'idle' or 'engaged' state. Next task is electro-mechanical adjustments and then to turn it over to the CPU team to see if they can communicate to/from the TAU to the drive. The 1403 printer still prints !! :-)) - mostly :-)) - a problem has been moved to column 131, by swapping cards, but then things got confusing - column 131 had been printing - and now would not!! What is going on?? 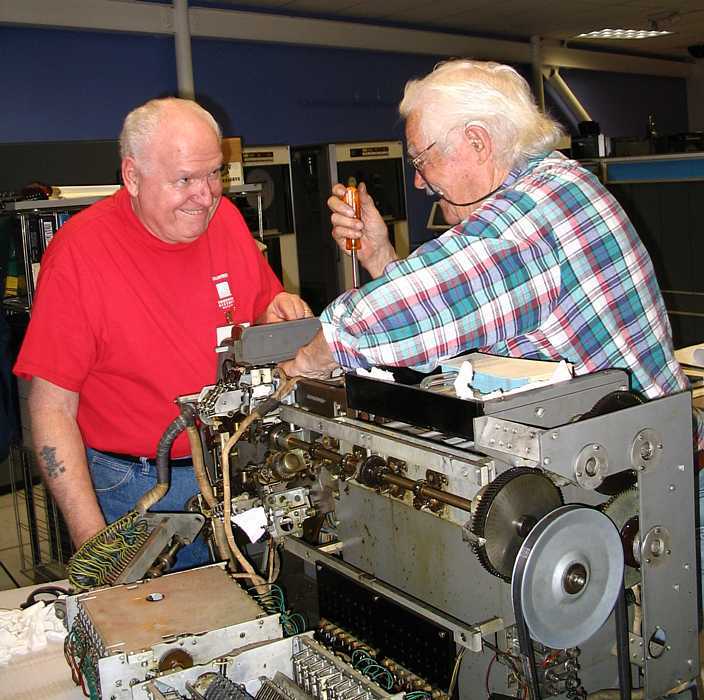 Frank & Bill replaced (soldered in) an open fuse to a printer driver card. The fuse in the other defective card seems OK.
We got extra printer driver cards from the 1401 in Visible Storage - they were a different part number on the same part number card - a wire on one version was replaced by a resistor in the other version - they seem interchangeable. This is the back side of the printer hammer assembly. The black air hose is from a fan used to cool the parts and blow paper dust out of the area. The German 1403 did not have "support rails" - so we got the rails from the unit in Visible Storage and removed the printer hammer assembly. This helps support the heavy assembly during rather delacate operations. This image is very confusing - you are looking at the BACK of the paper from the hammer side. This side is normally white - but got printed and reversed to save paper. - Sorry - So, you see the Hammer Assembly on the left, supported by the rails. The paper tractors on each side of the paper, and the hammer view of the paper to be printed - the ink is deposited on THE OTHER side of the paper. Frank King is holding a tool which has a central shaft with an excentric head. It is used to adjust print hammers. There is/was a 0.003 inch, thick 18 inch long, 0.500 inches wide ?mylar? flexible plastic ribbon associated with the print head assembly that had ?decomposed?? and was removed by vaccuuming. We need another inorder (lets get an 8 foot section?) to get the print hammer assembly correctly reassembled. 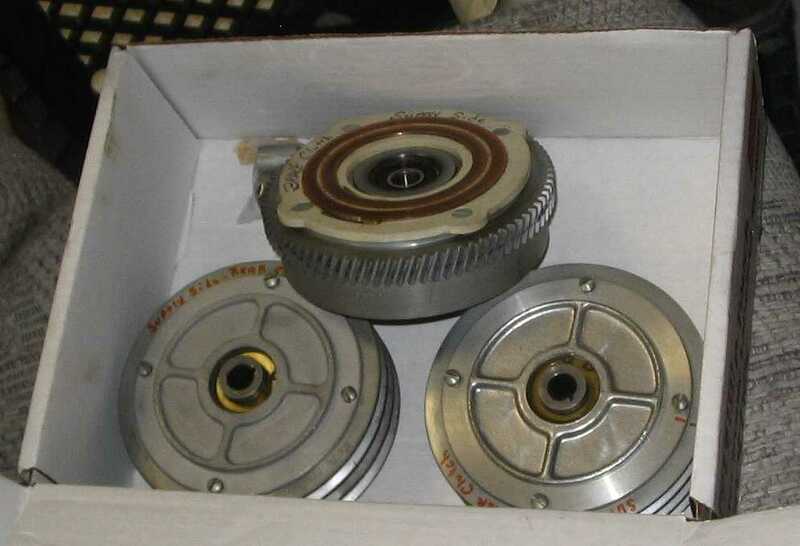 This is one of the re-re-built clutch assemblies. The two sets of belts are go in opposite directions. 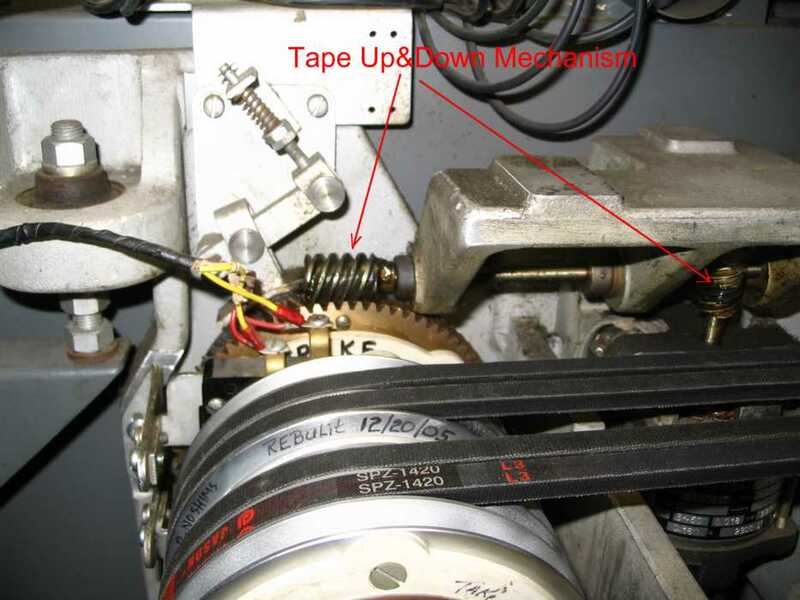 The arrows indicate the mechanism used to slowly lower the tape into the columns and also to slowly raise the tape out of the columns. This is a movie (5 megabytes) of the "Tape Up&Down Mechanism" working. The 5000 hour lamp that permits the high speed rewind has quit working - Allen needs another - not too eager to pull one from another 729 tape unit 'cause he would just have to replace it later. 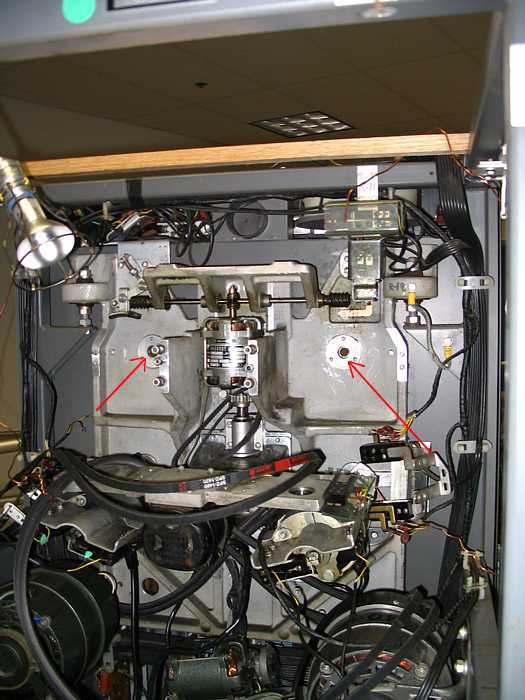 On the 077 collator - the 1/4 horse capacitor start motor cannot bring the normal machine to rated speed - we tested the starting capacitor with the ESR testor and the Effective Series Resistance seems correctly low (below that capability of the tester). 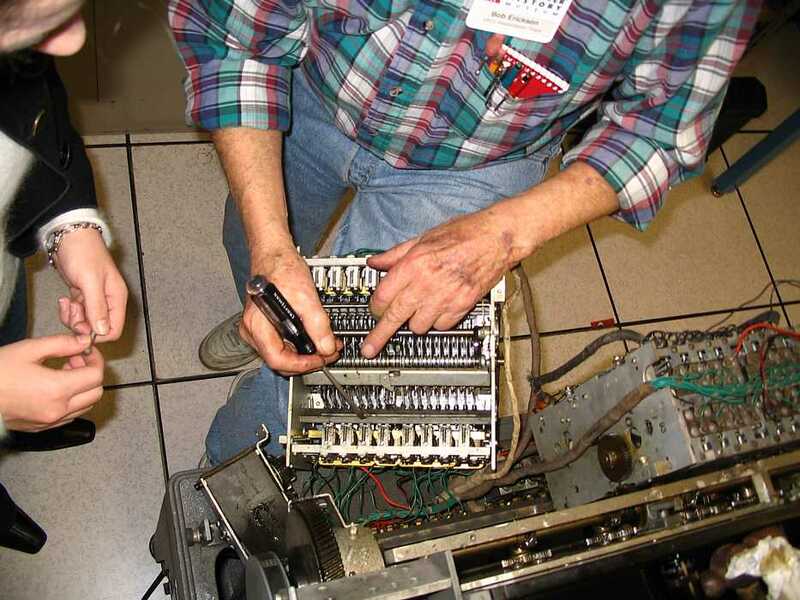 So Bob Erickson briefly removes the various read brush assemblies to get the machine up to speed - then re-installs the assemblies as the machine is	running. We discovered that the machine was working about 10% too fast - so made the motor V-belt about 10% smaller radius - now perfect - but still cannot start. The starting current is about 14 amps, the running current about 5 amps (a little high for a 1/4 horse motor?). We would like to check the name-plate rating on the motor of another 077 - say in Visible Storage. Should we get a 1/3 horse motor, 1/2 horse? - is this an indication of another problem? This is a movie (18 megabytes) of the front (operator) side of the 077 working. The machine is working about 10% too fast. This is a movie (28 megabytes) of the back side of the 077 working. Bob later counted out 240 cards and we adjusted the v-belt pulleys to do this load in 60 seconds. Bob Erickson is talking with Megan Masters, one of Allen Palmer's extended family. 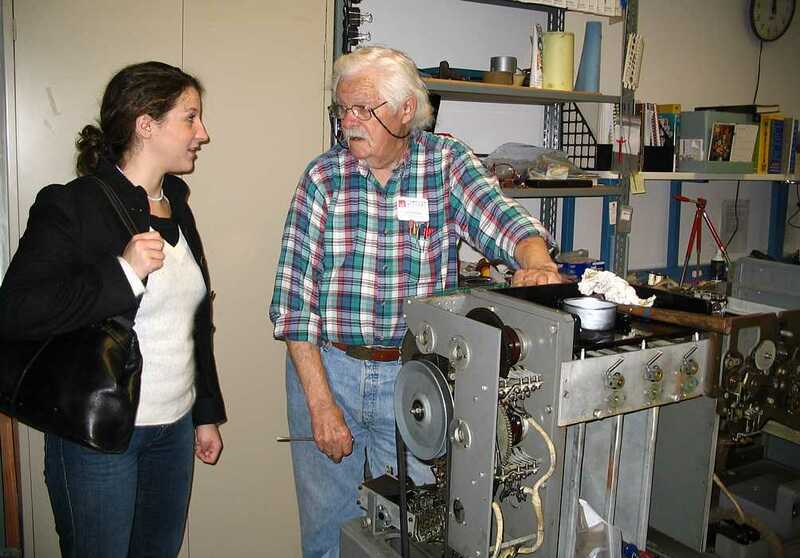 Bob Erickson is talking with Megan Masters about one of the comparitors in the 077.